Elite Series SSDs represent a big advance in storage technology, but are just the first of many SSD innovations to come from Biwin. The vast majority of laptop and desktop computers sold today are equipped with rotating hard disk drives (HDDs), making the storage system the biggest bottleneck in most client computing applications. Biwin, an industry leader in flash storage products, today announced Elite Series SATA III SSDs, based on the LSI® SandForce® SF-2281 Flash Storage Processor, that are designed to substantially improve storage performance in laptops and desktops. With a standard 2.5” form factor (dimensions: 100 x 69.8 x 9.5 mm), Elite Series SSDs are compatible with virtually any desktop computer and millions of laptops. They support 6Gbps SATA III, and are downward compatible with 3Gbps SATA II systems. Elite Series SSDs are equipped with performance enhancing features including Native Command Queuing (NCQ), TRIM, and Garbage Collection, as well as reliability features such as support for SMART commands, BCH ECC, and wear leveling. These SSDs address security concerns with AES-256 and 128 data encryption. Elite Series SSDs achieve sequential read and write speeds up to 550 and 520 MB/sec respectively, and support max 4KB random write speeds up to 65,000 IOPS. * The performance advantages over HDDs in both sequential and random workloads are very significant. Biwin offers the Elite Series in 60GB, 120GB, 240GB and 480GB capacities, with either Asynchronous MLC NAND for best value or Synchronous MLC for maximum IOPS performance. These models are all in production now, and will be available on Amazon and NewEgg in April. Capacities are before formatting. Usable capacity varies. Max seq. speed measured in ATTO Disk Benchmark. Max Random speed measured in IOMeter 08. Specifications subject to change without notice. DuraClass, LSI and SandForce are trademarks or registered trademark of LSI Corporation. 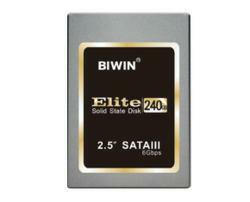 Founded in 1995, Biwin is a global leader in flash storage products for enterprise, embedded and client computing. The company has shipped over 100 million flash products to date. Learn more about Biwin at http://www.biwinamerica.com or http://www.biwin.com.cn.